In the spirit of working smarter (not harder), I created this graphic organizer to be used year after year, no matter what animal is the animal of the year for Chinese New Year! After talking about what Chinese New Year is, have the kids draw a picture of that year’s animal, and then write ideas about what that animal can do, has and is (see my friend’s example above). I recently saw another variation on this same note-taking organizer and decided to make one with my own Squarehead spin! 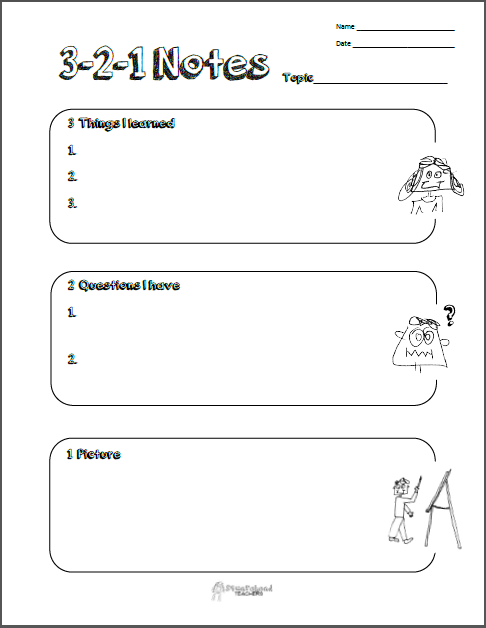 So, I present to you (drum roll please…) my 3-2-1 notes graphic organizer! Students will write 3 things they learned, 2 questions they still have and 1 picture illustrating understanding (teacher can specify what they should draw if needed). It’s official. I love using graphic organizers for teaching social studies. This time, I’m having my students teach each other about the causes of World War 2. Each kid will teach 3 other students. They can use their entire sheet for the first person they teach. When they teach the second person, they have to fold the paper so they can’t see the words, but they can use their drawings. For the final person, they can’t use their paper at all. Yay for graphic organizers! I’m getting good at them. I’m finding that the key is to make them simple so that the format doesn’t distract kids. Anyway, here’s my newest social studies graphic organizer. It’s about the causes of World War 1. It’s similar to the other social studies graphic organizers I’ve made.